In 2008, Seattle-based Unico Properties had an exciting project in the works. After rolling out their “inhabit” design, factory-built modern apartments that could be assembled on-site and arranged to accommodate a variety of features, such as private decks and green roofs, the company was slated to break ground in South Lake Union on a 62-unit complex. Unico put the project on hold when the real estate market tanked. The prefab-homes niche was devastated by the larger collapse in housing. In the past two years, several West Coast companies filed for bankruptcy, including Bellingham-based Transform LLC. Now, with the economic recovery gathering steam, there has been renewed interest in using prefabricated manufacturing techniques to make modern, green designs more accessible to home buyers. Several new companies are promoting the approach in Washington, among them GreenPod Intelligent Environments in Port Townsend; Seattle-based Greenfab, which installed a seriously efficient modular home in the Central Area in January (expected to achieve LEED Platinum certification); Method Homes, which has a factory in Ferndale; and Seattle-based Ideabuilder. These ventures offer a portfolio of new, green features, such as gray-water recycling, green roofs and heavy-duty insulation. But there is a great deal of skepticism whether they will be able to survive and offer a truly low-cost alternative to custom site-built homes. Prefab is by no means a recent discovery. In the world of home building, prefab is an umbrella term that covers many different building methods—from kit homes, with components cut off-site and then assembled on location, to mobile homes and trailer homes, which are not considered real estate since they are designed to be relocated. Prefab is also more appealing in lean times. Kaufmann thinks that the intersection of the current housing market, financial market and boom in environmental awareness has helped shift the mentality of home buyers away from the two-year flip (moving up the ladder to larger and larger properties) and toward a philosophy of efficient, smaller homes that will last. So why hasn’t modern prefab taken off yet? One reason could be clients’ desire for excessive customization. With prefab homes, architects attempt to strike the perfect balance between ease of construction and offering enough options to keep customers happy. It’s tough to walk that line, and adding too many custom features can quickly bog down a project meant to be simple and straightforward. “People who go to the trouble of getting a home that isn’t readily available are persnickety folks by nature, you know?” says Kevin Eckert, founder of Seattle-based architecture firm BUILD LLC. “They want something special, and that is where the prefab breaks right down. Our experience is that people want to start fiddling with it.” Andrew van Leeuwen, BUILD LLC partner and lead architect, explains that they’ve priced out prefab systems for clients, but found that the projects were similar in price to a cost-effective custom home. The problem with cost is twofold. First, the non-manufacturing expenses, such as site prep and utilities, are still the same. Second, prefab costs less the more houses you build. “To truly get to a point where you can have accessibility in cost and time, you need a certain volume,” Kaufmann says. “Factories work best at a certain volume. Paying overhead for not doing product, that’s where it falls apart.” Combine the current financial situation with the fact that modern prefab is not yet de rigueur in the United States, and it could explain why no one is cranking out eco houses on a large scale. Michelle Kaufmann designed this modern take on a Spanish California–style house for a couple in Santa Barbara. La Vardera also rails against the appraisal system, which can work against those wanting to build a green home. “If you’re doubling the amount of insulation, the bank doesn’t recognize it as added market value. They just see that you’re making that wall more expensive, and they don’t want to loan you money for it.” There’s a disconnect between the economic system and commonsense construction, he says, where more square footage increases value even though smaller homes use fewer resources. “The whole financing industry needs to get up to speed on green building,” Kaufmann believes. “The fact that they would not treat an energy-efficient house as being more valuable than a traditional house is sort of ridiculous.” She notes that appraisers and brokers have a tremendous opportunity to change the way the system operates, for the better. “Square footage actually means nothing. It’s so broken. It’s so antiquated.” She praises eco brokers, who look at green features in a more favorable light and consider long-term energy savings when valuing a home. 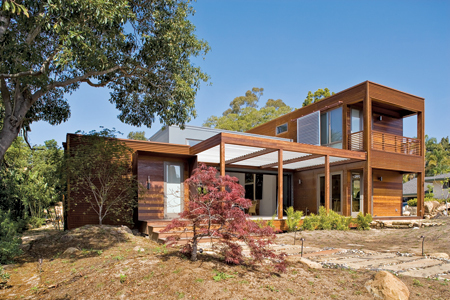 In the world of energy-efficient prefab, smaller is usually better. But to get the full benefit of the manufacturing process and generate the kind of volume they need to be successful, firms may have to focus on projects such as condos or apartments that are made up of many units, instead of building single-family homes. For a 106-unit townhouse project Kaufmann is currently working on, her factory cranked out eight homes in two months—the same amount of time it typically takes her to build one home, and at a reduced cost. “That’s where prefab really starts to sing, and do what we’ve all believed for so long that it could do,” Kaufmann says. She thinks that layering some single homes in with larger projects could be a good technique to keep the manufacturing process cost effective. At least one company is bucking the “smaller is better” trend. Greg Howes, CEO of Ideabuilder, has adopted a high-tech approach to building that has become standard in much of Europe and is using the approach to build luxury homes for clients. The homes are designed on a computer in 3-D. The computer system then spits out specs that are sent to a factory in Oregon, where they are fed into a highly automated production system that uses robotics to put the modules together. “Construction is usually a form of controlled chaos,” Howes says. “There’s a lot of waste.” But by doing detailed 3-D designs in advance, many potential problems can be identified and fixed before any wood is cut. Ideabuilder recently put the modules together for a $1.1 million house sited on a $1.5 million piece of property on Bowen Island, British Columbia. The framing and “dry in” took just three days, compared to as much as three months for a home of that complexity built on-site. “The more complex the project is, the more of an advantage we have in terms of efficiency.” He says the houses are “greener” because the very process of construction produces less waste. Barron notes that GreenPod is still working on figuring out what production level it needs to be sustainable. The company is currently working on two homes, and his goal is to keep the factory busy year-round. He says that with about an eight-week production period per home, the business could initially build seven or eight houses per year. Ann Raab, one of the owners of GreenPod, says the company focuses on offering a complete package—homes that are sustainable inside and out—and she hopes to draw customers interested in eco-friendly textiles and options for custom interior work by local artists. 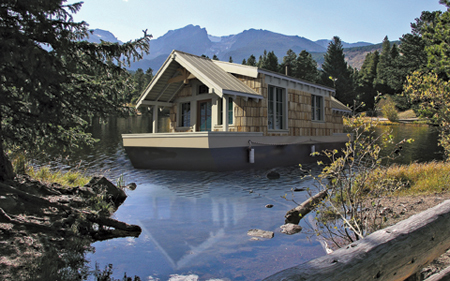 The progressive Northwest is certainly a good starting place for small, green homes. It remains to be seen whether innovative design and smart construction can make those homes widely accessible.